Within the last few years, low-carb diets have become all the rage, and for a good reason, too. They aren’t just fad diets; there is significant evidence that eating low-carb is a widely successful means to lose weight, in spite of their high-fat content. However, no diet is one size fits all, and a low-carb lifestyle might not work for you for some reasons. For some folks, it’s not a sustainable diet, either financially, nutritionally or mentally. For others, it just may not have the expected effect. Here are a few reasons why this kind of diet may not work out for you. One of the most significant downsides to low-carb dieting is the toll it takes on your wallet. A diet that limits carbs means the need to buy more meat (if you aren’t also a vegetarian, that is), and even the cheapest kinds of meat can become a considerable expense when you’re buying them a lot more often. While low-carb diets often promise that cutting down on carbs will decrease a person’s appetite, it can have the opposite effect on some and dieters may find themselves hungrier than when they were still eating carbs regularly. 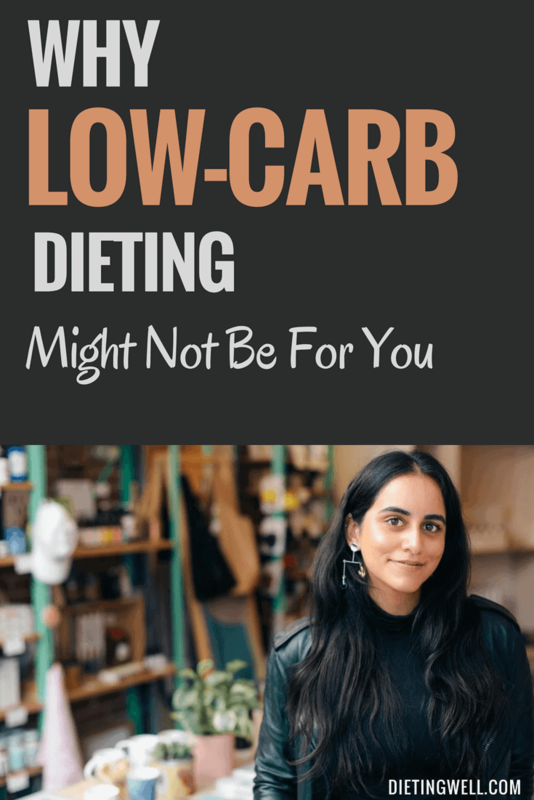 Choosing a low-carb diet will mean giving up a lot of foods, and if you happen to love eating carbs, you’re going to have a tough time reconfiguring your diet to work with minimal carbs. Unfortunately, a lot of cheap staple foods are off-limits when you go low-carb, which ties back into the cost aspect of this type of diet. Things like milk, bread, potatoes, and pasta are forbidden, and even healthy carbs like yogurt, oatmeal, and fruit are off the table. At best, only certain fruits are allowed in a low-carb diet, and even then, only sparingly. If you happen to not like some low-carb foods like avocados, kale, and mushrooms, then your choices will be limited further. 3. Substitutions that don’t match up. You can find endless resources that offer low-carb versions of tried-and-true classics so you can stick to your diet while enjoying the foods you love. That sounds wonderful, but like any diet food, the healthy versions almost never taste as good as the original ones. This fact is especially true of sweets, which require artificial sweeteners and non-wheat flour. Some of these desserts might look convincing and even tasty, but the truth is that they often taste strange and have an odd texture, which can be good in a way because it discourages you from eating dessert. You might also need to purchase additional (and expensive) ingredients just to make them work that you wouldn’t need to buy when using everyday items. Xanthan gum is one such ingredient. It acts as a binding agent in low-carb and gluten-free recipes. 4. Dining out becomes a struggle. You can pretty much forget going out to eat because there is no way to tell if something a restaurant serves has carbs in it unless you go to a restaurant that specializes in low-carb options. Your server may not know the ingredients in a particular dish, and the cook or manager might not care enough to be honest with you. While most restaurants are willing to do things like making you a cheeseburger without a bun, it’s easy to order something that would typically have minimal to no carbs in it, and later you learn it’s full of carbs because of the way the restaurant prepares it. Low-carb dieting is hard work because, to be blunt, you can’t just eat like an average person. You need to scrutinize everything to find the carb content and make sure you stay within your calorie limit, often needing to go so far as to weigh food with a kitchen scale and record what you eat, which you can’t do when you’re at a restaurant. While several apps now available make that much more manageable than keeping an analog food journal (MyFitnessPal is a godsend for most dieters), it can get old fast going out of your way to record and measure every single crumb. So if you’re low-carbing, either don’t go out to eat and plan on only having coffee, or allow yourself a cheat day and plan meal outings around that day. 5. Not getting proper nutrients. When you cut out things like fruit and dairy (well, most dairy; cheese is fine for low-carb), you can find yourself becoming deficient in several vitamins in a big hurry. Can’t have bananas, so there goes an excellent source of potassium. No fruit means no Vitamin C. Since fiber is considered a carb, you have to cut down on that, which can cause some digestive issues. You’ll need to take supplements to compensate for what you won’t be getting from food. One thing you’ll get plenty of on a low-carb diet, though, is cholesterol. When you’re eating a ton of meat and eggs all the time, your cholesterol will go up, so if you get a lipid panel done, be sure to let your doctor know about your diet, so they don’t freak out about your sky-high LDL. Some low-carb dieters, especially those on ketogenic diets, report what has been called “keto flu.” That is when your body enters ketosis and adjusts to the lack of carbs, making you feel a little sick for a while. The symptoms often mimic those of a mild flu bug and can include other side effects such as lightheadedness and nausea. Some low-carbers also experience issues with concentration and memory because the brain needs carbs to function normally. For most folks, these symptoms disappear once they become accustomed to a diet with fewer carbs. For others, however, the keto flu is a mainstay until they reintroduce carbs. 7. The diet has to be done long-term to work. Probably the worst part about low-carb diets is that you don’t stay on it for short while until you get the desired result and then go back to normal. You need to give up carbs forever because the second you go back to eating carbs, you’re going to gain back every ounce you lost. No one can seem to agree on whether or not low-carb diets are sustainable long-term. Some people say these high-fat low-carb diets are too unhealthy to keep up and will wreak havoc on your body and health. Meanwhile, others say that you’ll not only be healthier, but you’ll live longer if you eat bacon, cheese, and eggs for the rest of your life. That is not to say that low-carb diets are harmful or ineffective. You can find tons of personal accounts from folks who have done Atkins, keto, and paleo diets (all low-carb) who dropped weight like crazy and felt fantastic. However, no one diet works for every single person. You might find that low-carb dieting just isn’t for you because you can’t afford to do it long-term, you don’t like the limited food options, or you don’t want to give up pasta. The only way to know for sure if low-carb dieting is right for you is to try it. If you find you don’t like it or have trouble sticking to it, there are plenty of other diet options available that you can try to see if they’re a better fit for you. I don’t agree with any any of these points. I agree that it “can” be expensive to switch to a keto lifestyle, but when compared to how much most of us spend on processed sugary and salty garbage that comes in a box, I don’t think the cost of whole foods would be that much of a jump in budget. You don’t have to buy expensive cuts of meat, you can get protein from canned tuna and salmon, etc. I’m buying keto for just myself in a household of 4 and my grocery budget hasn’t went up with the exception of getting started on my dry goods like coconut oil and almond flour. Lack of variety? I hardly think so. There are dozens if not hundreds of websites that have keto and low carb recipes to choose from. Take a look at pinterest and use keto recipe as a search term. The results will blow you away. Substitutions don’t match up? Well, you may not be able to make EXACTLY the same thing as you would if you were making a non-keto recipe, but there are enough recipes that come close enough to “the real thing” to not be enough of a reason to quit the keto diet. I made a chocolate cake using zucchini last week and it tasted spot on like cake, same texture, same sweetness, only 1 gram of net carbs. Dining out? As long as the menu has baked meats or salads, it shouldn’t be too hard to find something when dining out. If you’re going to a fast food restaurant, you maybe shouldn’t be on keto in the first place because I’m not sure there’s too many healthy options at McD’s. Not getting proper nutrients? If you read any blog about starting the keto diet, you’ll know all about supplements! Magnesium, potassium and sodium being primary. Taking vitamins and minerals to replace electrolytes that are flushed out of your body on keto is part of the way of life. Feeling awful? It’s called the keto flu and it only lasts for a few weeks and some people never experience those symptoms (myself included). I switched to a low carb diet several months before I started keto and by the time I started the keto diet I was already eating less than 25 grams of net carbs, taking supplements to replace electrolytes and I NEVER felt awful from day 1. The diet has to be done long term to work? Really? I don’t know how many testimonials I’ve read online where people have lost 10, 20, 30 pounds in a month on keto. It doesn’t take a long time to see results if you are sticking to your macros and not over-eating. People continue to lose dramatic amounts of weight over the long haul that they stick with the keto diet. There are also people that have seen other health benefits besides weight loss as well. Dramatic reduction in their bad cholestorol while raising the good cholesterol after only a few weeks on keto.